Record labels usually focuses on promoting the music itself, forgetting that it is closely related to sound. Every now and then, companies are created that try to do something about it. One of the newest is the Dutch company TRPTK, which is the following text is about. Let’s be honest: there are many record labels and new ones are coming almost every day. This of course involves an incredible egalitarianisation of recordings—today you can arrange a home recording studio for just a few thousand dollars. Never before has music recording been so easy, so cheap, and so widely available. It’s an incredible value that young people just get today on a plate. However the process of popularizing recordings has its dark side, that’s how the “opening” of professions works: the average sound quality of the recordings has decreased dramatically. And, secondly, it is increasingly difficult to find truly valuable releases because they all flow in the same information noise. So how do you find true pearls like TRPTK? Honestly, usually looking for something else, by chance, or most often, by recommendation. The paradox of modern times turns out to be that the real information reaches us in the oldest way known to human kind, that is through the story told by another person from our, broadly understood, group. In my case it was a recommendation from Marcin Ostapowicz, the owner of the JPLAY/JCAT. We are TRPTK, pioneers in sound. We believe that every artist deserves to convey his music, his story, in the very best possible way. This is an opening declaration one finds on the website of the Dutch recording label named TRPTK (pronounced ‘triptik’), established in 2014. There were many companies in audio history using high-end recording devices that were also able to utilize these devices properly. Only a few managed to combine that with the artistic values of their releases—surprisingly few. Apart from large, old labels, Japanese Denon, Audio Lab. Record, Three Blind Mice, American Telarc, Dutch Channel Classic and—something even closer to the high-end audio—also the Dutch company Turtle Records (currently Challenge Records International) come to mind. The latter seems to truly fit the description, as it was one of the first record labels that invested a lot of money not only in devices but also in cables that they still use today—also Dutch Siltech. Even compared to those examples, TRPTK appears to be quite a special entity. Let’s start with music. This is a company that treats musicians cooperating with it in an extremely honest manner. As you will read in a while, this applies to sharing profits with them as well as to the care provided during recording. They are not afraid of publishing releases with difficult, improvised music, assuming that it is not a commercial potential that counts, but an artistic one. The second thing is related to the cover art. When I opened the TRPTK website, I immediately knew that I was dealing with perfectionists, people sensitive to aesthetics and dreamers. What surprised me was great design, great typography, and sophisticated photographs. One of the founders of the company, Mr. Brendon Heinst, a sound engineer by education, a photographer by passion is responsible for the latter. It is clear therefore, that the CDs this company releases are different than most available on the market. First, we pay attention to the non-standard size of the releases. They have the dimensions of DVD boxes, but are not made of plastic, but cardboard, with a plastic insert—it’s like a “long-digipak” box. Each release is a separate world of images, with fantastic pictures on the cover and interesting essays in a large booklet. We will also find basic information about sound, by Mr. Heist, who is usually also the main producer, ending with three—important from our perspective—logotypes: KEF, Furutech, and Hegel; JCAT will also join them in the latest releases. As I said, we are talking about a company that has uniquely successfully combined three types of art in music publishing – music, design and sound. Unusual, as for a company associated with sound recording, is that in the process of recording, and then mixing and mastering, products related to the high-end environment are used, not ones usually found in the pro world. It’s good news for us. For the recording process key elements are, of course, microphones. The main ones are Sonodore RCM-402, sometimes supported by Sonodore MPM-81 Tube and DPA 4006a and DPA 4011a. Microphone signal goes to Sonorore MPA-502 mic preamps, powered by 60 V. But cables are high-end ones made by Furutech—both microphone, signal and power. Then the signal is converted into digital form, using in the Merging Technologies HAPI. The signal is recorded on a special, optimized computer with a linear power supply and JCAT card. 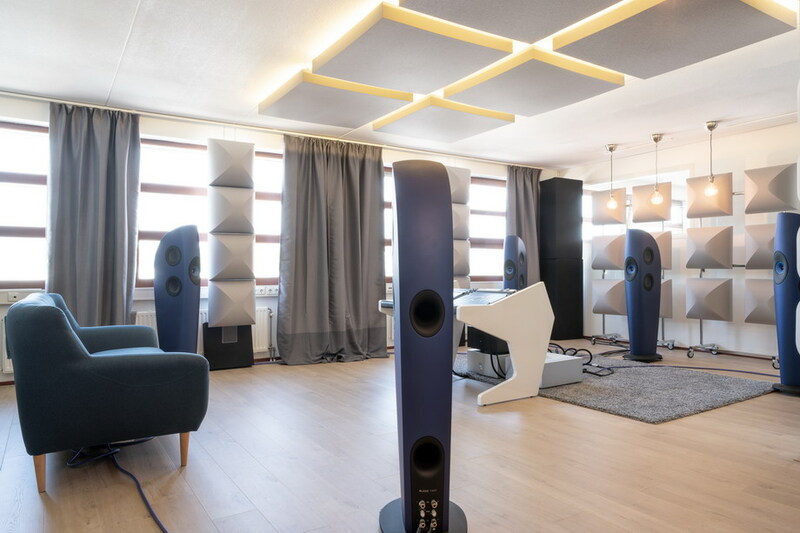 We met Brendon Heinstem during the High End 2018 in Munich. I was surprised by his “audiophile” approach to recording and the attention to detail, such as power cables—a controversial thing in the world of pro audio. When I learned that in the recording process he utilizes an audio interface using Ethernet for data transfer, I immediately suggested that he should try my products: the world’s first audiophile JCAT NET Card FEMTO and the Japanese M12 SWITCH GOLD network switch. I was sure that these accessories would bring a lot of good to the TRPTK studio and that’s how it happened—they started to use both permanently. I am glad that I can cooperate with such an uncompromising studio, which with openness, without prejudice, implements components into their system that are beyond the cognitive reach of a competition. Beginning from microphones and preamplifiers for them, they use products that even in our industry are treated with suspicion—such as CAD Ground Control GC3. They are also useful in the mastering studio. It is a large room with a computer in the main role—mixing and mastering are carried out using “in the box” technique, i.e. using plug-ins and computer modules. 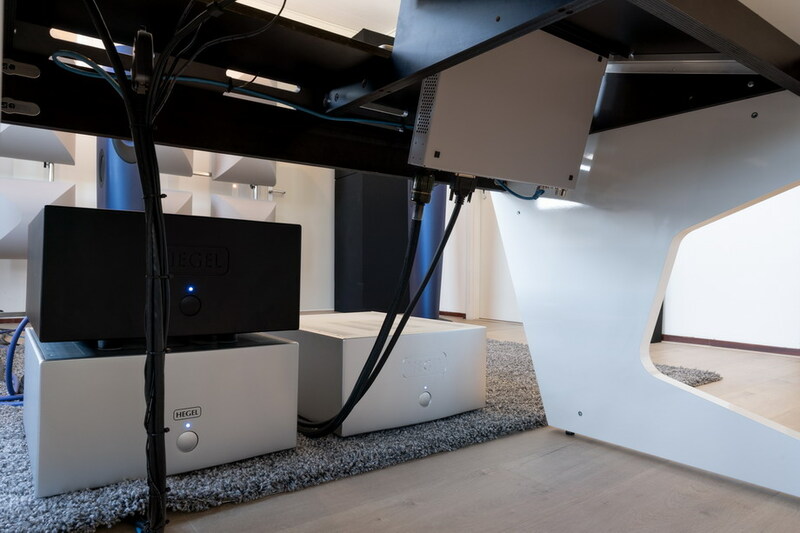 Hegel’s stereo amplifiers H30 are used to amplify the signal, while the speakers are the beautiful KEF Blade Two—five of them arranged around the listening position according to the ITU-R BS 775 guidelines. Acoustics of the room was prepared by Acoustic Matters. 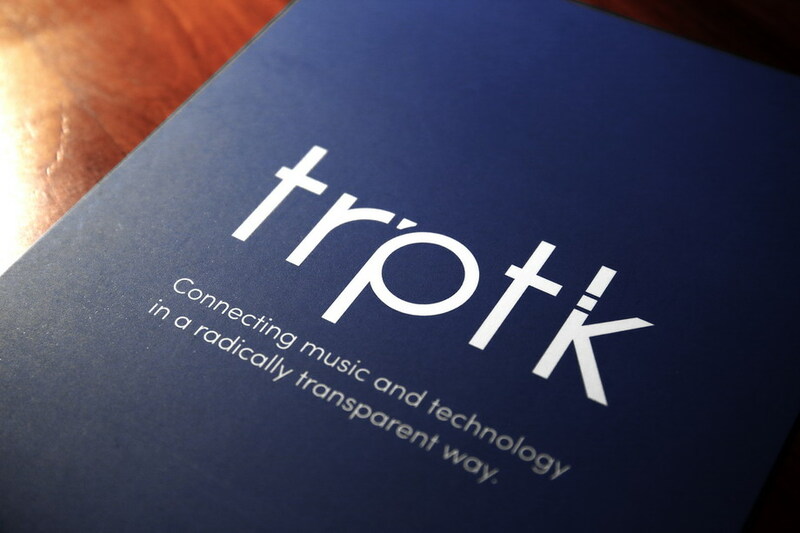 The TRPTK is a company of the 21st century, it is focused on recording sound in high definition. They do it in an extreme way, because they record sound in DXD quality, which is 24 bits and 384 kHz PCM in a multi-track recording. The signal is then mixed into stereo and to 5.0 versions. We can buy recordings in three ways: either as classic Compact Discs, or on pendrives or as download available online. The last two options are the most comprehensive, because we can buy not only a two-channel or five-channel version, but also choose a signal quality—PCM from 24/96 to DXD and also a DSD version, up to DSD256; for the latter signal is converted from DXD. Although pendrives look great, CD releases are also very nice. The box is large and features beautiful printing. 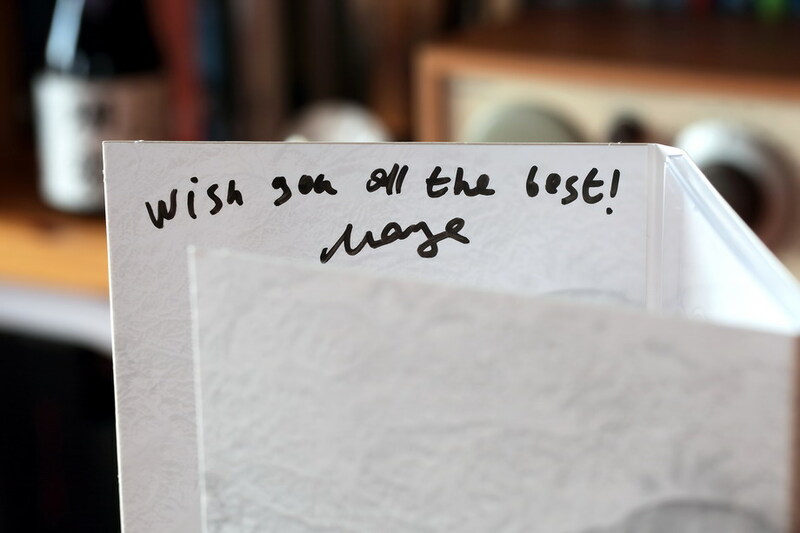 It’s a three-part “long-digipak” with a booklet inserted into the notch of the back cover. This is the only weak point, because the notch quite quickly breaks off at the edges, which does not look too aesthetic. The booklets include essays of the creators and a brief description of the technology by Brendon Heinst. Some photos from the session would be a nice addition, as well as a diagram presenting the musicians setting on the stage. Last but not least, all discs are placed in foil envelops—I do exactly the same thing with mine. 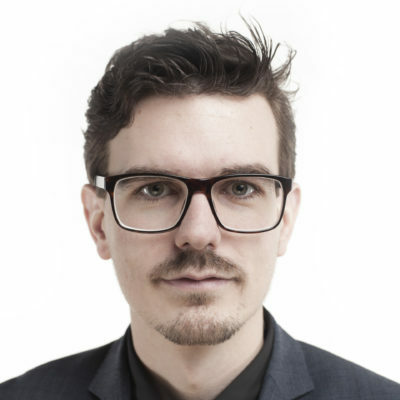 WOJCIECH PACUŁA: Tell us something about yourself. BRENDON HEINST: I’m Brendon Heinst. Born in 1990, I’m still very “young” in this world of audio engineers. I’ve always had an enormous love and passion for music in any genres and have been playing instruments ever since I can remember. I started playing the piano when I was merely six years old. While in my teen years, I started picking up other instruments too, such as the acoustic and electric guitar, bass guitar, double bass, basically anything I could get my hands on. During this period, I also started developing (no pun intended) a love for photography and design, and their link to music. 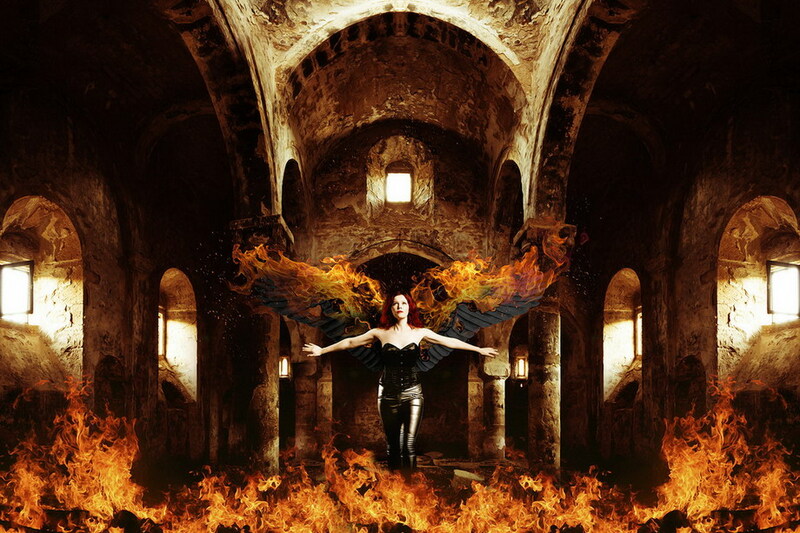 I would see images or visuals when I wrote, played, or listened to music, and would try to capture these images. I also love to tinker, to take some kind of equipment, take it all apart, inspect what makes it work and how, and hopefully, put everything back together. I never had any clue I would turn all of these “hobbies” into what I would do for a living later on, until my father passed away a number of years ago. This event prompted me to focus on following my dreams of combining all of this into a certain sound and image, which would later become TRPTK. In this period, I started studying for a Bachelor’s Degree in audio engineering at the Utrecht School of Art and Technology. Here, the concept of what you could do with sound recording in an acoustic setting like classical and jazz music, really blossomed in my mind, and I knew this was what I wanted to pursue in my life. 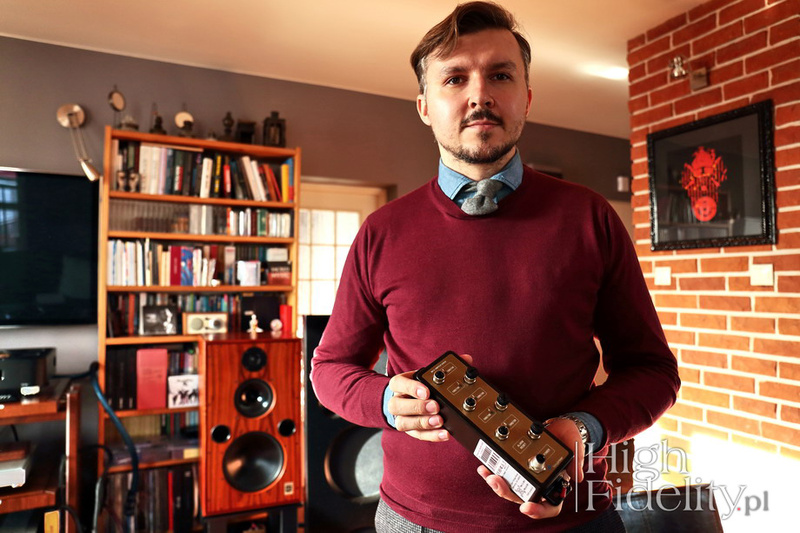 After getting my Bachelor’s Degree, I continued doing a Master’s Degree in audio engineering under Eelco Grimm (from Grimm Audio), focusing on high-resolution multi-channel recording for acoustic music. For my thesis I wanted to develop a recording technique or microphone setup that would function as a main microphone system of the highest transparency while maintaining compatibility with all channel systems; from mono all the way to 7.1 and 9.1 surround. How did the TRPTK come about? TRPTK originally started as a movement by myself and my then college friend and roommate Luuk Meijssen, who was doing a Bachelor’s Degree focusing on mono recordings. Since his study and mine, while being totally different, had so much in common we decided we would try our microphone techniques together on the same ensembles. Luuk would set up his mono system, and I would set up my surround system. During this period, I was asked by the amazing cellist Maya Fridman (who later became my wife) to record her and pianist Daniël Kool performing Schnittke’s famous/infamous cello sonata (Alfred Garrievich Schnittke was a Soviet and German composer born in 1934, who died in 1998 – ed.). We did, and after shooting the artwork, we wanted to sell the album as a whole to different labels. Unfortunately though, these labels weren’t interested based on two reasons: first of all, they thought Schnittke would be a hard sell as it’s not that accessible, musically. Secondly, the labels all found the artwork we shot to be “not classical enough.” Mind you, that Maya didn’t just play classical cello, but also played in rock and even metal bands. The term “classical” doesn’t completely fit her, in a good way! 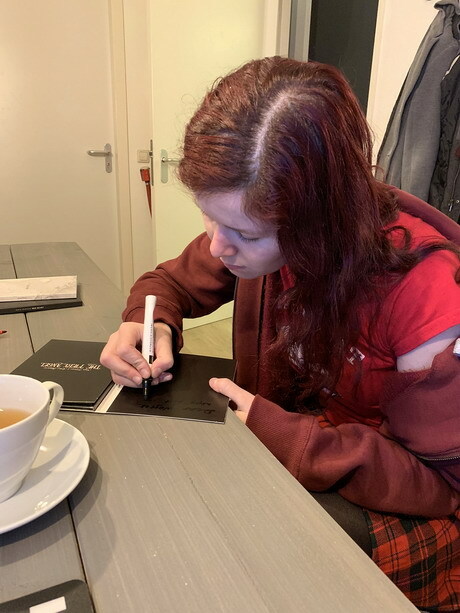 This, together with my growing issues with the music industry, where artists and their music are being treated as a commodity, a product, and nothing more, prompted me to write a huge email to Luuk at one point. I still recall, it was just pages upon pages of my frustrations about this music industry, all written at something like four o’clock at night. Just a day later, I actually received a great email back from Luuk, who worked in the pop/rock music field and saw a lot of these same issues happening there. Our idea together would be to make a compilation album with many artists and many different genres, displaying what one could do if music was treated like it is, a form of art. Recording at the highest quality possible, without the infamous “radio edit” of 3:30 minutes, but letting the music run free. But, as all things go, we got carried away. We figured that making just one compilation album is probably not going to change the music industry. Also, we would still need to find a label to publish this, which could potentially break down the whole plan of “flipping off the music industry.” We then (in 2014) decided to start a label, which, together with another partner, we named TRPTK. But why a new music label—it is very tough business, isn’t it? In short words: yes. Yes, it is a very tough business. The music industry as it is right now is pretty over-saturated, to be honest, so trying to break through as this small independent label, was tough as nails. Especially since one of our main philosophical pillars is that we want to treat artists fairly by giving them a 50% cut of all profits made, which means that our margins are razor thin. But we felt it was a necessary step in trying to show the music industry, both in the classical music world and jazz/rock, how things could also be done. To be frank, we’re definitely not entirely there yet. For us to stay sustainable, we need to release a considerable amount of new titles every year and do this with great artists. This is tough when you’re not Deutsche Grammophon, or ECM, or Universal Music for that matters. But we continue to fight for what we believe in, and we’re finding more and more artists who share that same dream and who want to collaborate to achieve this goal. Why CDs? Vinyl seems to be more trendy and files as well. Great question! CDs are slowly but surely diminishing in sales, which is something we see too. At the time we started the label, they were still pretty much the standard for all releases. Of course, you’re not able to push the full DXD Studio Master onto a Red Book CD. But people want a physical copy of something, they still do. Vinyl could be an answer too, but for smaller independent labels, this is highly costly if you want to do it right. We see a steady decline over the last year of artists who choose not to release any physical product at all, but just have their music on streaming and download platforms. My thought is that this number will continue to grow, and the physical product might disappear some time in the future. Vinyl is great, especially great vinyl, but unless our artists ask specifically for it, the costs at this moment at least outweigh the benefits right now. But, and I don’t want to jump the gun on this, TRPTK might very well release a vinyl record somewhere in 2019. Do you have your own method of recording? We do actually have our own method of recording, yes. This technique is a combination of the microphone arrays I have studied in my Master’s thesis, but with the usage of the state-of-the-art equipment, microphones, and cabling that we use, by companies such as JCAT, Merging Technologies, Sonodore, KEF, Hegel, and Furutech. The microphone technique I use is something I referred to in my thesis as Optimized Omnidirectional Array, optimized for three attributes, namely absolute fidelity in timbre, absolute fidelity in timing and impulse control, and lastly, absolute fidelity in imaging. How this works is a bit of a long story, but the recording technique is based on the famous Decca Tree-system, but much smaller for better imaging. To create this, I use three Sonodore RCM-402 microphones, true omnidirectional microphones with an immensely flat frequency response and incredible timing control. Ours are 60V active powered, which removes the issues of phantom power (phantom power; 48 V – ed.) entirely and raises the signal-to-noise ratio significantly. I use these in conjunction with a pair of microphones for the rear channels, as well as the odd microphone for supporting single instruments in an ensemble. I try to avoid these spot microphones as much as possible, keeping the system as minimal as possible. This all in an effort to enhance clarity. More about our recording technique can be found in our recently-released TRPTK Book, that can be purchased on the website (HERE). What kind of recording equipment do you use? Aside from our Sonodore microphones and preamplifiers, we use a variety of high-end products, maybe too much to name but here goes: For conversion, we use the Merging Technologies HAPI converters, one for AD conversion, and one for DA conversion. These link to our fanless, audio-optimized recording computer by network protocols, so we use JCAT’s equipment such as the M12 Switch Gold and their FEMTO NET Card with an external linear power supply. Then, we use some miscellaneous things such as Computer Audio Design (CAD) Ground Controls, an ingenious device that eliminates all sorts of issues in your power system. Using this on our microphone preamplifiers and converters has truly made a gigantic difference in sound. Cabling-wise, we work exclusively with Furutech, who even made custom microphone cables for us. Furutech is an amazing company with a philosophy very similar to ours, which is to create a uniquely transparent signal path for music to just simply flow. We (very proudly) use their top-of-the-line NanoFlux NCF power cables, LineFlux XLR cables, and much, much more. We recently did a recording test where we elevated all our microphone and power cables above the floor using their new NCF Boosters. A lot of work to set up for eight cables running over 20 meters, but darn was it worth the difference! You are recording everything in DXD, why not in DSD? DSD is an astounding format for recording, really! The filtering issues you might have with PCM (except for DXD) are just too much for really good recording. But that being said, you can’t edit or mix anything in DSD without converting to PCM first. So, while DSD may be perfect for live, pre-mixed concerts, in most album recordings, you tend to repeat passages of the musical material, and make an edit featuring the best takes from these passages. This cannot be done in DSD without going back and forth between it and PCM, thus being detrimental to the sound quality. As an export format, we do support and sell DSD (in the 64fs, 128fs, and 256fs flavors). DSD is a great sound if you have the right playback equipment. That being said though, I do still prefer to not use any sample rate or bit depth conversion for the sake of sound quality, hence that I always suggest people to download the DXD version if their system supports it. How do you engage artists to such esoteric, I mean stressful recording sessions? Recordings, for me at least, should feel to the artist like their special day. The moment they walk into the recording venue, be it a church, a studio, a concert hall, wherever, all equipment is set up and ready for their music to flow freely. So, we try to create a totally stress-free environment for the artist. Only then will the music be perfect. One artist recently commented that we’re not just audio engineers, but also a sort of a psychologist, trying to optimize the relationship between the performers in an ensemble or between the performer and the engineer. This is a delicate process, but in my opinion the most important one in the recording process. Your engineering skills can be amazing, and your equipment even more so, but the music will sound bad if you’re not good at communicating with artists. In this world of record producing, there are unfortunately so many egos out there. Tonmeisters whose sole vision is that they are in fact the masters, the artists. All the while, the musicians are just their means to their goal. This in my view, is a completely toxic albeit way too frequent issue. Without wanting to sound pretentious, my aim is to have TRPTK grow and become one of the bigger labels, but all the while staying fully independent. We have some amazing artists that we’re going to work with in 2019 and 2020, and many more interesting releases. We recently set up the sub-labels TRPTK Sessions and TRPTK Live. TRPTK Sessions are small recording sessions released as EPs, from all kinds of upcoming talent. TRPTK Live is a sub-label for high-res, no-compromises live recordings. Our first release on this sub-label was Nocturnal by QOPE, with improvised solo piano works. But many more are to come! What does TRPTK stand for? First and foremost, the fair treatment of artists. Pay them well for their amazing work and help them with making their dream album. We pay out 50% of our profits to artists without any hidden fees. Most classical labels pay out 0%, to 25% in some rare cases. Secondly, create a platform for young artists and composers alike, to showcase their works in the best possible way. For us, this means using this state-of-the-art equipment and crazy expensive cabling. But also, this is only as a means for artists to ultimately express themselves. Lastly, we want to try and change the music industry. Get rid of the statement of “people are just going to listen to it on Spotify with their white earbuds, why should I care?” or the sense that music is a product and not a form of art. Music is ultimately in my opinion the most important form of art and needs to be acknowledged as that. TRPTK will do anything within its possibilities to make sure that that happens. The most important feature of TRPTK recordings is indeed an amazing transparency. Mr. Heist talked about it several times, but in real life, the declarations of the company’s owner are only declarations, most often they are just wishful thinking. When you listen to a few CDs released by this label, you will I think, come to the conclusion that he emphasized this aspect not often enough. Maybe he knew what transparency does, the freshness of this sound is not an goal in itself, but a way of presenting something more—a natural timbre of instruments and voices. The CDs differ from each other and you can tell that although the general frames are the same for all of them, each of the projects required a slight modification. 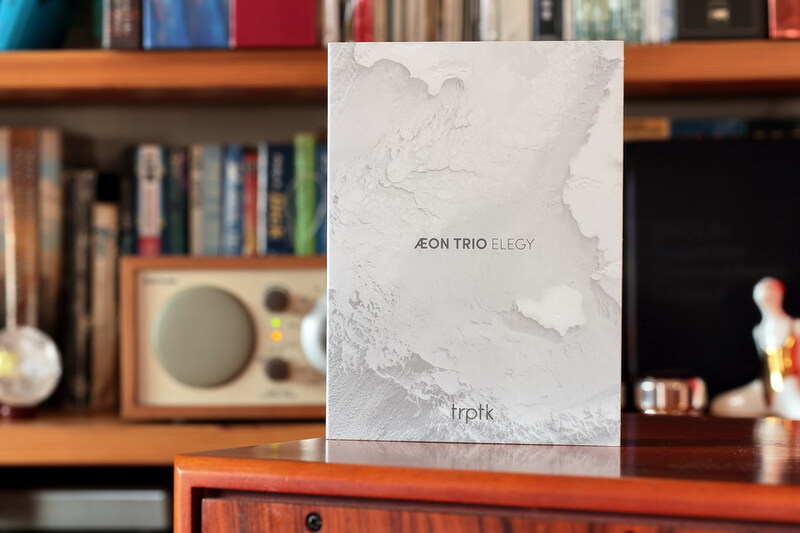 Take, for example, the The Fiery Angel with music by Sergei Prokofiev, arranged for cello and piano, and Elegy by Aeon Trio, a piano trio, with piano, cello, and double bass. The duo’s album is extremely spacious, and the tonality is focused in the middle of the band and its top. Reverbs, decay, details, differentiation in terms of tone and dynamics are unprecedented. What attracts attention particularly is the dynamics, because only now one can hear what one’s system is capable of in this respect. The space is in turn shaped so that we hear slightly distant performers, with the important role of reflected sounds. However, the bodies are very clear and well focused, there is no blurring of images. In turn, the Elegy, which includes interpretations of jazz and classical music, sounds closer, a bit warmer, more “here and now”. The instruments have perfect space around them, but the image, the whole picture, is shifted closer towards us, which makes this sound more intimate. Listen to the double bass—it’s fantastic! Strong, full, dense, very “wooden,” but still well defined. In the recordings of purist companies, let it be Naim Label and True Stereo technique (two stereo microphones, Ken Christianson technique, more HERE), the double bass is somewhat blurred and distanced. Here it’s quite the opposite. One similarly perceived the sound of cello and piano. They were full and saturated. Although clearly separate, they retain a similar character, sharing the same real space. 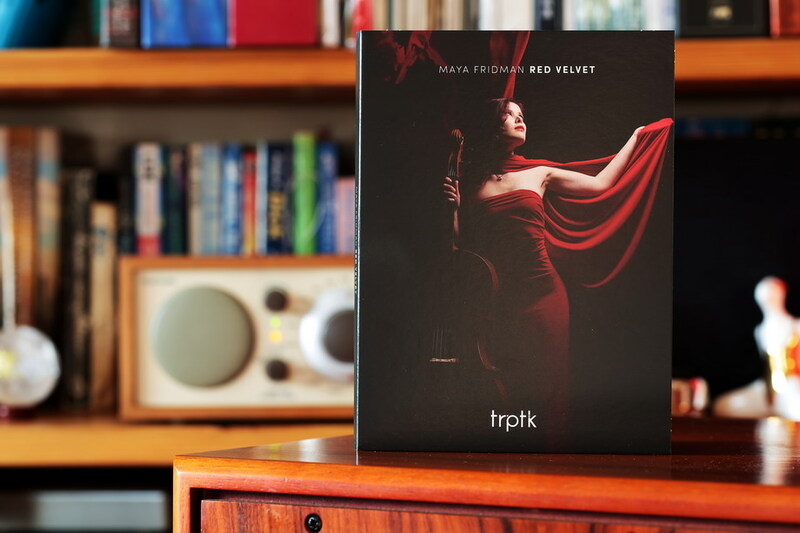 And yet in another way we perceive the Red Velvet, a CD recorded in Utrecht, where you can hear mainly the Maya Fridman’s cello, but also electronic instruments and voice. Here, the main instrument is recorded from a distance, that is, there are a lot of the reflected sounds in its sound, and yet it sounds very—so to say—firmly, densely, it is fantastically saturated with “wood”. It is a clearly “distant” recording, but retaining the density of bodies, as well as their contours. And again, there is this aforementioned extraordinary dynamics. 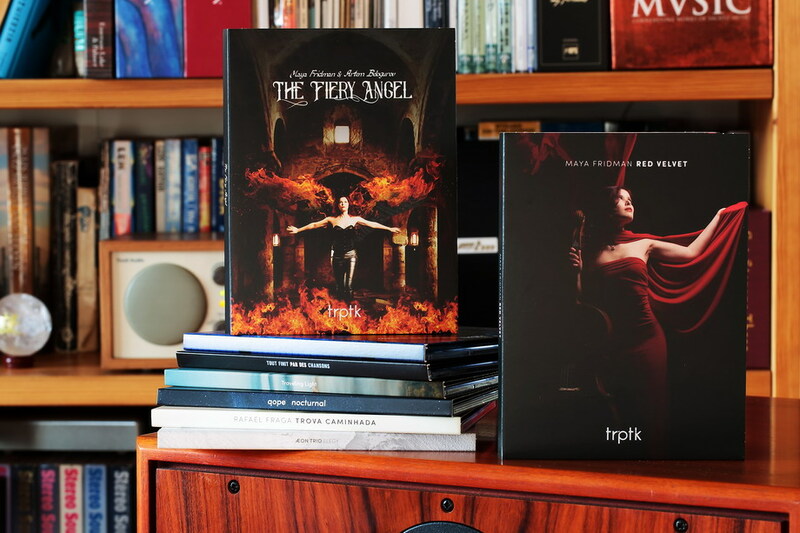 Listening to TRPTK discs we tend to constantly increase volume to get stronger sounds; they are so clean, so engaging, that we start to listen to them as if we were in a real room with them. Because this is the case when a new space is created in our room—it is a whole new world. We will get the closest perspective with the Trova Caminhada album, with the Portuguese guitarist Rafael Fraga as the leader. This session was recorded in Studio 2 MCO (Muziekcentrum van de Omroep), where, in addition to the basic microphone system, also spot-on microphones were used for specific instruments and for vocals. The sound is very intimate, there is little ambiance in it, more “meat”. In a way however, it is still a “live” recording because there are not too many treatments that “beautify” sound in post-production; one is under an impression of participating in a concert, although without an audience. It would be easier for me to encourage all of you to buy all TRPTK recordings you can, if they were all commercially “friendly,” and they are not. It is completely different situation with this record labe—buying requires reflection, focus, encourages exploration and making choices. In addition to improvised, avant-garde music requiring full concentration and commitment, you will also find completely classic recordings that you can listen to with a glass of wine in your hand and a good book on your lap. 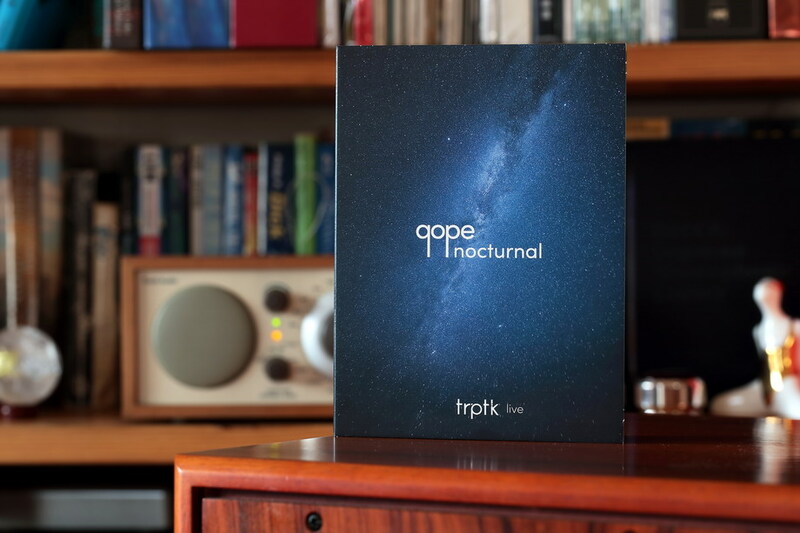 The Trova Caminhada by Rafael Fraga and Nocturnal by Barte Koppa are great examples—the latter belongs to the sub-series TRPTK Live. You can also approach the matter differently, following the Maya Fridman trail, and you will get to the classical music on The Fiery Angel on the one hand, and jazz arrangements on the Elegy on the other, but also dense, disturbing, emotionally deep music on the Red Velvet. This record label enables it through, above all, a constant, high level of performers, as well as a coherent idea for the sound. This varies depending on the release, but always shares some common features: transparency, dynamics, density, and space. And besides CDs, the company sells music via the Internet and on USB pen drives, and in several different versions. Buy the highest resolution files your D/A converter supports, preferably DXD, and you’ll see what files really have to offer. Equally important, as everything I’ve already described, is that this is a record label that does fall into an audiophile niche, like many others did, that cared about high quality sound and forgot about music. A consistently built “portfolio” of artists who have something important to say is a good prognosis for future. For my part, I wish there were more DSD256 recordings—I think it is a perfect format for concerts released as part of the TRPTK Live series. I would like to wish the whole TRPTK team and their artists so that they manage to maintain this high level and fulfill their dreams of creating a segment of the music industry, based on a new type of agreement between the artist, the record company and the public.